Do you know what the most incredible streak in baseball history is? It’s not Orel Hershiser’s 59 scoreless innings or Joe DiMaggio’s 56-game hit streak or the Oakland Athletics’ 20 consecutive wins. It’s Jim Callis’s mock draft streak. In 2005, while writing for Baseball America, Callis correctly predicted the first 18 picks in the MLB first-year player draft. Callis, who now writes for MLB.com, recently took some time to speak with me about that historic mock, as well as about what we can expect from this year’s MLB draft, which runs June 5-7. What follows has been edited for length and to eliminate my stammering, and has been formatted to fit your screen. You can find Callis’s latest mock draft here. Be sure to look out for his work on MLBPipeline.com leading up to the draft and on MLB Network on Thursday night during the draft itself. How do you go about assembling a mock draft? I talk to as many agents and scouts or scouting directors as I can to try to get information from them on who they think’s going where. I think it’s a lot different than if you were doing an NFL or NBA mock draft … you always read about how all the executives lie to the writers and send out misinformation. In baseball, you can’t trade the picks, so I think guys are more open. I’m never going to get 18 in a row again, but usually I feel like if you gave me two or three choices I could run through different scenarios with all the information I have and figure it out. How did you feel about your 2005 mock when it went up? Or is the draft so unpredictable that you don’t worry about such things? I like to tell people it’s kind of a catch-22. I take a lot of pride and try to get as many things right as possible, but I also realize it’s almost an impossible task. Once you miss your first pick, then things kind of snub off from there. A lot of times you’ll know the no. 1 pick and feel like you’ve got a pretty good handle on the top three or four picks, but you never feel like you’re going to get 18 in a row right. The funny thing is, I peaked early. I’m never going to come close to duplicating that again. When did you realize you were going on a streak like this? I remember telling my wife. She’s a casual baseball fan, but she’s not a draftnik, but she knows how much time I put into it, so she’ll ask me, “How’d you do?” So she asked me and I said, “Well, I got the first 18 picks all in a row.”… I don’t know what the mock draft record is, but that’s got to be up there. I made the comment I made [earlier]: (1) I’ll never come close to doing that again, and (2) If this was the NFL draft, I would be the most famous sportswriter in the world for at least a couple days. If that happened today, like you said, with Twitter and the draft being on MLB Network, you might be the most famous sportswriter anyway. Obviously there’s a lot more focus on the draft. I don’t know anyone who’s in sportswriting for the glory of it — it’s kind of a cool thing that’ll get brought up, or people will ask about it. The funny thing is, we’ve had, what, nine drafts since then? And if you’re doing just straight picks from the top, my total correct for the nine drafts since then might be around 18. That 2005 draft had a couple huge hits — I count two MVPs and about half a dozen All-Stars in that first round — and some huge busts. Who from that draft panned out the way you expected and who surprised you, for better or worse? That was probably the best draft in the past 10 years. I thought Jeff Clement was going to be a really good player. Mariners fans will hate hearing this, but that was one of the picks that changed at the last minute. … Up until that final weekend, the Mariners were really locked in on Troy Tulowitzki. That was going to be their guy. If you’d told me that [Clement] wasn’t going to catch, I would’ve said OK, but if you told me he was never going to do anything offensively in the big leagues, that would’ve surprised me. The other thing I remember too was Jacoby Ellsbury. It seemed like Jacoby Ellsbury, at least according to the information I had, was the second choice, from 15 to 22, for about five of those eight teams, but the guy they had rated higher got to them. Let me ask you a couple questions about this year’s draft. You had California prep lefty Brady Aiken going no. 1 overall in your last mock — how likely are the Astros to select him? It’s tough, because the Astros [are so secretive]. I still think he’s the favorite. … If I had to pick three names for them, I think it’s Aiken, [NC State left-hander Carlos] Rodon and [high school catcher] Alex Jackson. From what you’ve heard, is there a surprise name that could wind up going in the first round? To me, the surprise would be someone like [Kennesaw State catcher] Max Pentecost, who could go as high as no. 4 to the Cubs, or a guy like Nick Howard, who was the third-best prospect on Virginia coming into the year and could go in the teens. Who’ll be the first player from this class to make the big leagues? Is it Nick Burdi or Rodon or Jacob Lindgren, or someone else? It should be a reliever. I like Jacob Lindgren — he’s left-handed, it’s a wipeout slider. Among starting pitchers, I really think it’s going to be Aaron Nola of LSU, another SEC guy. He’s not the most big or physical guy, but his stuff’s solid, he can really pitch. I won’t say I’ve examined every one of his starts, but I don’t know that he’s had a bad start the past two years. Do you have a favorite player relatively few other people are in on? Texas had a pretty heralded recruiting class of pitchers three years ago, and the best guy coming out of high school was John Curtiss. 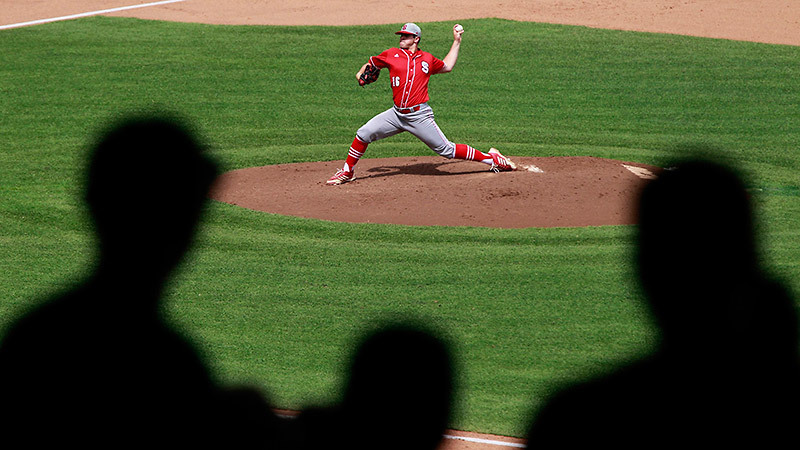 He wound up having Tommy John after his freshman year and while he was coming back from that, he had thoracic outlet syndrome, where they wind up having to remove a rib because it’s pinching a nerve. This year, he’s come back, just pitching out of the bullpen, and he’s been 92, 94, 96, and like a lot of guys coming off Tommy John, the breaking ball and the command aren’t as sharp as they once were, but I do think that’s a guy who might prove to be a steal, because he looks like he’s on the road back to what he was. Unlike a lot of draft-eligible sophomores, I think he’s signable. He’s a really smart kid — he graduated with a double major from Texas in three years. Use your magical future-telling powers again: Is there a story line to look out for on draft night, whether it’s a player or type of player falling or a trend in draft strategy? I think the most intriguing story line to me is what’s going to happen with these injured pitchers, with Jeff Hoffman and Erick Fedde having Tommy John surgery. Hoffman was in the running to be the no. 1 pick, and Fedde was in the running for the top 10 — where do these guys go? Especially in light of all the pitcher injuries this year in the majors.